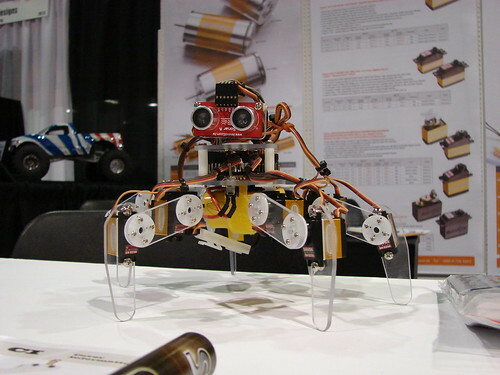 RoboSavvy Forum • View topic - Fall Chibotica/iHobby 2008, Who's Going? 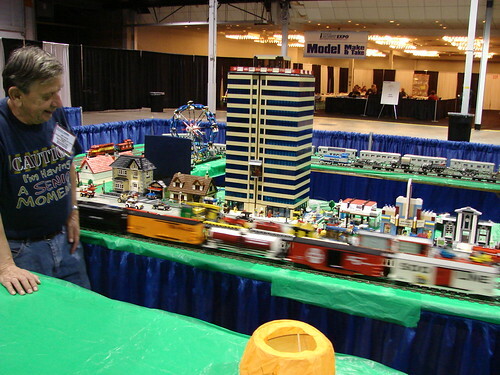 Fall Chibotica/iHobby 2008, Who's Going? I found a cheap way to get from KC to Chicago. I am going to take the train! My round trip ticket only cost me 90.00 dollars! That is cheaper then by car or plane. 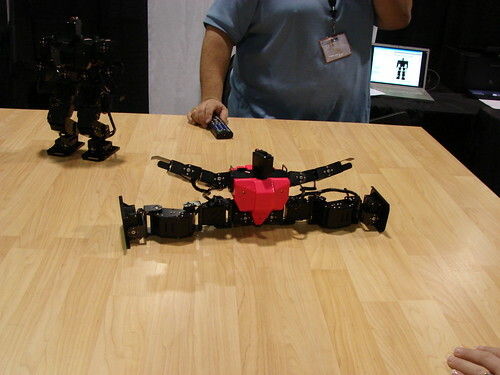 I know that Hitec will be there but no one from the robotics side of the company. What about Robotis or other robotic companies? Only about two weeks until the event! I just saw that the RoboPhilo creators will be there. I hope that gas prices and the economy will not limit attendants? I just checked the site, Rob Farrell (Bullit) is going with Zog! This will be a great time! Dell Latitude D520, Windows XP, 4 GB RAM, 80 GB HDD, Intel Core 2 Duo. The power that's needed! Matt Bauer is also on the list of people who will have tags made, although I have no word if he will be joining us for Kung-Fu. Here is a link to the iHobby floorplan. It lists the booth that will be at the event. The bottom right hand side is where most of the robot action will be. I was hoping Robotis would be there, although I can't find them. I also don't see RoboPhilo. Maybe not all companies are listed? MINDS-i will again have a booth. I am interested in what they have done in the last year. At iHobby 2007, they thought that the kits will be out in Spring 2008, which never happened. What ever the case, I'm sure we will be seeing them sold soon! It looks like that there will be over 10 humanoids at I-Hobby! the turn out is going to be a lot bigger than I thought. 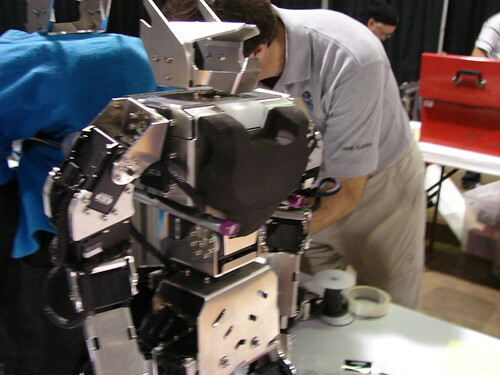 It sounds like Chicago is the place to be this weekend if you are interested in Humanoid robots. Gort wrote: Scotty, will it only be you and me with humanoid robots? Marc Lampcov, who was at iHobby 2007 will be there will his new company Robofactors (while he won't let me say what it is, I can say it will be a new humanoid robot ). Yup, I'll be there all right, and thanks for the mention Scotty. We've had an incredibly rough road getting this bot together, and it was looking pretty bad for a while, but in the last couple weeks things got back on track and we will be there. The new bot is coming together nicely, but we're not quite done with the controller. We will have moving bots there to show, and I'm pretty excited about it. Join the Mech Warfare Competition! there. Now (roughly) follow "Line 2" all the way to "Lobby and Badges". labeled "Exhibitor". If you signed up *after* September 17, go to the normal booth (I'm not sure of it's name) and pay the $10 (I am not sure of the fee). correctly, after both paths from parking join, you must go down stairs. few builders where talking about this last year), and get your robots ready. Last edited by srobot on Wed Oct 15, 2008 9:15 pm, edited 5 times in total. Did you just get the schedule? That only gives us one hour for three events? There may be over 10 humanoid robots? Well, we're here at iHobby! It's pretty cool watching everything get set up. As for Robots, I saw our friends from RoboPhilo are here, Hitec is here, with a much smaller booth than last year, and out booth-mates Trossen Robotics will be arriving tomorrow morning (Lucky b@stards are local!). The Chibots area is killer impressive. I heard the union guys bitching about all the tables and electrical drops they had to do. Good job guys! Way to upset the union. Can't wait to see all that can make it! We need to get an article in Robot and Servo magazine about Chibotica! With lots of pictures like RoboGames got in both magazines. Royce needs to put his presentation on robots on-line so people can see it. As of 30 minutes ago, I am back home! I tried to get the pictures and video on my computer to upload yesterday, although I can not figure out my new camera.... I'll read the manual now that I'm home and get those up soon! Mike - How was stairs and demo? I will email Robot and Servo and see if they want to use some pictures. Big thanks to Royce for running the show! Unfortunately the majority of my time was spent manning the Trossen Robotics booth, we were getting swarmed over there. Probably the most interesting thing there: Farrell Robotics' new bots, Zyn and Kai! I had a blast talking with the Farrells again, they're a great bunch. I learned a lot in the short time I spoke with them, and checking out their new bots was awesome. We even had Zog (or was it Oro?) come over to our booth and fight a Robobuilder I was controlling at the time. They took it pretty easy on me, but some of the results were pretty hilarious (ie: me trying to kick them and knocking my own bot backwards when the kick landed). We have video of the fight that we'll get posted sometime soon.